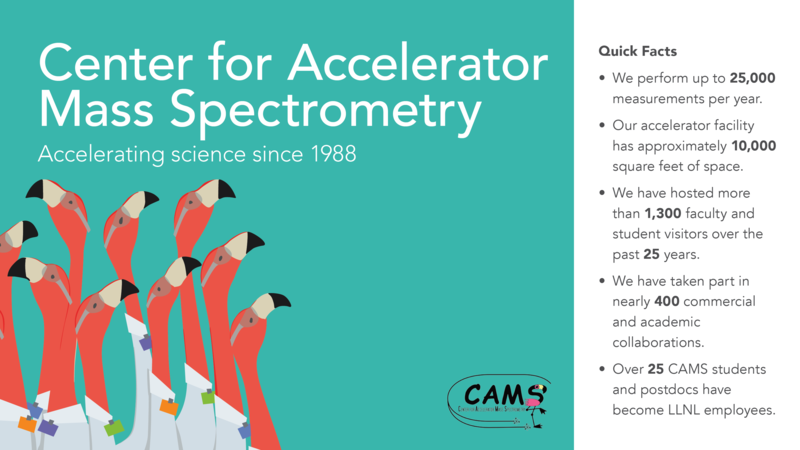 View the CAMS fact sheet on how accelerator mass spectrometry works. The CAMS facility is open to researchers from around the world and has been an important training resource for the U.S. and international science community. As an institute within LLNL, CAMS has a strong track record in hosting under graduate and graduate students and post-doctoral researchers. Scientists and students are encouraged to participate in AMS runs analyzing their samples and, when possible, assist in the preparation of samples dedicated to their own dissertation, thesis, or research projects. Depending on the project requirements, duration of visits span two-to-three days to multiple-month intervals. For general enquiries about research visits to CAMS please contact Graham Bench or the CAMS administrator Nanette Sorensen. CAMS provides over 100 tours each year to visiting students, teachers, scientists, scientific leaders, and other interested members of the public. These tours highlight the applications of AMS and help inspire current and new generations of scientists. It is recommended that the group size not exceed 15 people at a time as the environment is noisy and people in the back of the group will find it difficult to hear the tour guide. There are times when B190 will be in exclusion mode, and no one can tour at the time, so try to give us at least a few days notice to make sure we can accommodate your group. General Public/community Tours: Please call the Community & External Relations Office with your tour request at (925) 422-4599.